C-MOR Video Surveillance is a Virtual Machine software. The free version supports one IP camera without any limits. It can be upgraded to support 15 cameras. It records a lot of IP cameras of well-known IP camera brands. C-MOR Video Surveillance VM is a Virtual Machine software. 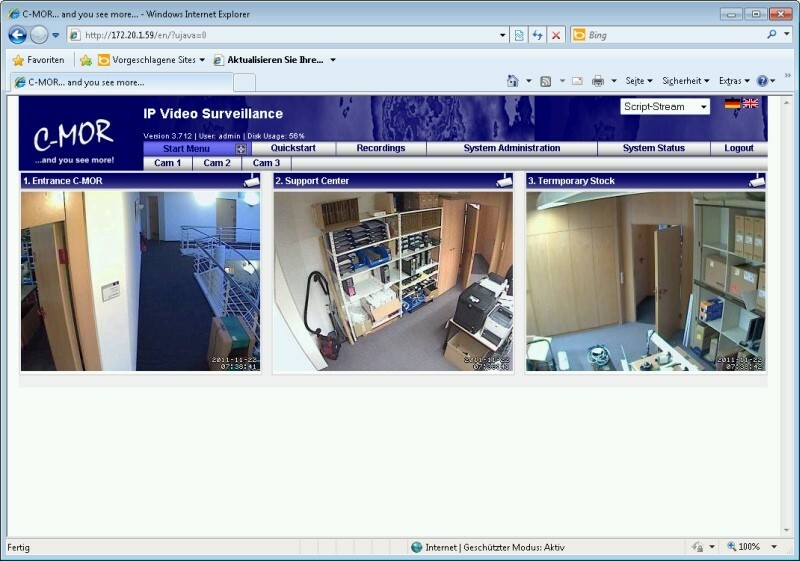 The free version supports one IP camera without any limits. It can be upgraded to support 15 cameras. It records a lot of IP cameras of well-known brands and supports the video standards MJPEG and JPEG. C-MOR also does motion detection and sends alarms. Also it records time-lapse videos and optionally single frames. C-MOR runs in the most web browsers and supports mobile devices like Android, iPads and iPhones without client software installation. The web interface of C-MOR is intuitive and very easy. C-MOR installs itself by simply booting the ISO image in a virtualization environment like VMware, Xen, HyperV or VirtualBox. C-MOR supports the IP camera vendors 4XEM, ACTi, Axis, Airlink, Dlink, Level1, Linksys, Mobotix, Panasonic, Sony, TP-Link, Trendnet, Vivotek and many more.